Mist envelopes you - and warms. California Sunshine is knitted in two halves, starting from the center using a provisional cast on. The lace part is knitted from the top down, and later the provisional stitches are picked up and knitted in short rows to finish the shawl in a lovely crescent shape. 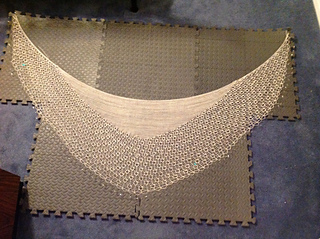 The shawl is 12 inches deep, 64 inches wide at the top and 78 inches at the bottom, relaxed after blocking.